The stylish, and swiftly rising violinist Robyn Bollinger, an alumna of the Maui Classical Music Festival, just so happens also to have stayed in my family's guest cottage while she was here. 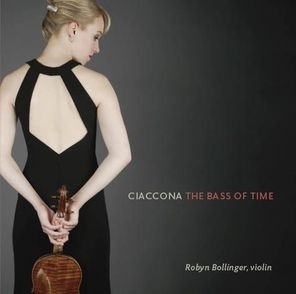 Her premier recording—Ciaccona: The Bass of Time (Crier Records CR 1701)—juxtaposes baroque and 20th-century compositions each built on the foundation of a single short, repeating rhythmic and melodic cell. Our selection was the monumentally proportioned Passacaglia of the Bohemian composer Heinrich Ignaz Franz von Biber. (Though historically distinct, the forms of passacaglia and ciaconna are close enough often to be regarded as identical.) Unfazed by the tehnical hurdles, Robyn progresses through Biber's stately maze with exceptional steadiness of attention, never anticipating, never rushing, thoroughly grounded in the moment. On other tracks, she plays music of Béla Bartók and Luciano Berio, as well as the ciaconna of all ciaconnas, from J.S. Bach's Partita No. 2 in d minor. 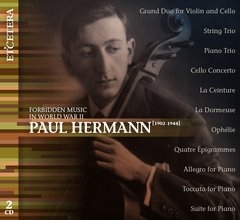 The master cellist Clive Greensmith, an alum of an earlier edition of the festival and another houseguest of my family's, is heard on the double CD Paul Hermann (1902-1944): Forbidden Music in World War II (Etcetera KTC 1590). Born in Budapest, Paul (or Pál) Hermann was himself a cellist, and as such enjoyed a stellar reputation throughout Europe. As his dates and the subtitle of the album suggest, he was also a Jew, one more among the six million lost in the holocaust. He was not, in the Nazis' preposterous phrase, a "degenerate" composer—not stylistically at any rate. On the evidence of the tracks we listened to, his idiom is conservative but by no means stale, with eloquence and personality to spare. Clive's selection is listed as "Cello Concerto," but consists of a single movement, accompanied by piano. Ably partnered by Beth Nam, Clive makes a thrilling case for it. Clive also performs on an orchestral version accessible on the website "Following Pál." For an encore, we gave a spin to Hermann's baroque-inspired, pyrotechnic, yet robustly melodious Toccata for Piano, which Andrei Banciu dispatches as if possessed. 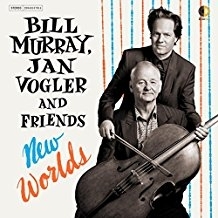 For something completely different, we turned to the novelty New Worlds, a mashup of readings by Bill Murray (yes, that Bill Murray) with instrumentals by the star cellist Jan Vogler and Friends (Decca Gold 80027187-02). Supposedly the program, which is also being presented on an intermittent international tour, "showcases the core of the American values in literature and music." Does this sound just a little grandiose? One track pairs the Andante un poco mosso from the composer's late Trio No. 1 in B-flat Major, D. 898 with prose from The Deerslayer, by James Fenimore Cooper, a novel the composer did not live to read, though he was much taken with earlier novels of the author's dealing with American Indians and frontiersmen. Though the humdrum musical performance and the brusque recitation turned me off, I rolled the dice (you'll excuse the mixed metaphor) on a second bite of the apple. A good thing, too. In "It Ain't Necessarily So," from Porgy and Bess, Murray kills it as a gravel-voiced Southern preacher man. It doesn't hurt a bit that the instrumentalists go wild, too. 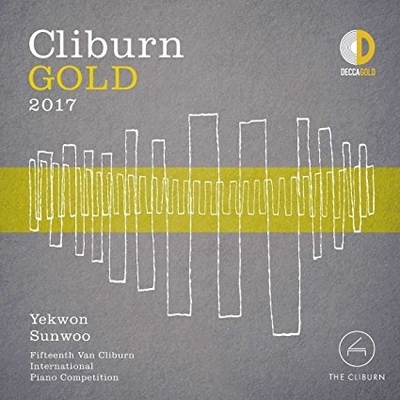 To close, we dropped in on the South Korean pianist Yekwon Sunwoo, Gold Medalist of The Cliburn 2017 (Decca Gold 80027008-02), in live takes from the competition. As usual, all contestants were required, in their preliminary recitals, to perform a brand-new showpiece commissioned by The Cliburn for the occasion. This year, the Canadian virtuoso Marc-André Hamelin, who dazzled local audiences in January with a recital at the Maui Arts & Cultural Center, whipped up a toccata—another toccata!—on the chart-topping, supposedly secular anthem from the Renaissance "L'homme armé" ("The man in armor"). Warlike in mood but of obscure import, "L'homme armé" inspired at least 40 settings of the ordinary of the mass. In Hamelin's hands, its jagged phrases flash like a beacon through the spray of dancing notes. Listening to Sunwoo's whirling, pinging passagework, I thought of Turner's seascapes, as feathery as they are tempestuous.